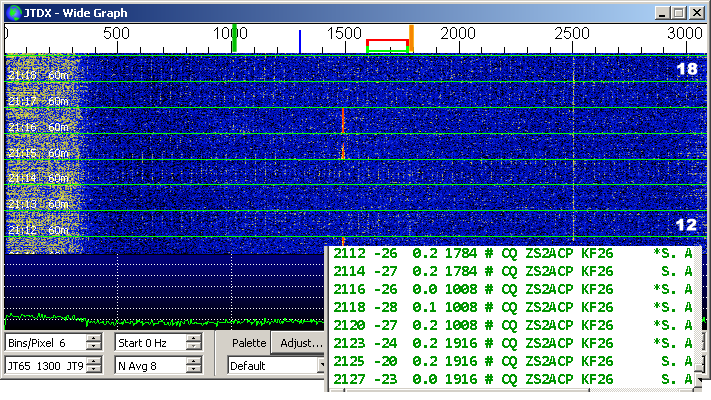 It is quite obvious that the internet helps to spread news very fast and thus, a real FT8 explosion took place. On busy moments there is a myriad of stations and it is impressive to watch how good the WSJT-X software decodes the whole bunch every 15 seconds. Hats off for the developers! However, in line with what I said earlier, missing the “bottom dB’s” is a distinct disadvantage. Although my private schedule has been very busy and does not allow for much time for the hobby, I sometimes work in my shack with JTDX (JT65) and WSJT (FT8) running in the background, monitoring 60 m to know what is going on. But because there is almost no operator interaction, you simply sit and watch. A distinct difference between meteor scatter and HF is that one has to wait for the meteor scatter pings and bursts and that is exactly why meteor scatter can be exiting whilst FT8 on HF gets boring soon. Responding to a CQ is also challenging because you have to reply immediately. If your transmission starts too late during the period, the chances of a good decode at the other end diminish. I also noted that if a number of stations reply at the same time on the frequency of the ‘DX’ station, the interference causes problems and it is likely that nothing will be decoded. It is better to call ‘split’ frequency, but I have seen many cases where these calls jump on another QSO. Sometimes because of bad operation practice, but it can also go unnoticed that frequency is occupied, because of absence of propagation. Because of the shorter intervals, the signal reports are rather inconsistent. I assume that fading and interference contribute to the differences. For propagation research, this aspect is an important disadvantage. A lot of decodes have to be averaged to get a more reliable ‘measurement’. I noticed that FT8 renders more false decodes than JT65. Although these can be distinguished form ‘real’ stations in many cases, because of the weird calls and grids, it is annoying because JTAlert triggers false ‘alarms’ and it also sends confusing spots to reverse beacon networks. The green and yellow markers on top of the waterfall mark the frequencies where ZS2ACP was transmitting and this illustrates how good JT65 works with weak signals. FT8 gets unreliable below -18 dB whilst all CQ’s of ZS2ACP were copied steadily with levels of about -26 to -28. As a result, one gets blindfolded for the best DX. Destinations like 5W1, KL7, 3D2 and the like become ‘out of reach’. I am glad that stations like Tony, 3D2AG hold on to JT65. Finally, the FT8 frenzy has a clear advantage: working a rare station with JT65 is a lot easier because of the fewer stations using this mode. As said, I appreciate those who stick to the slow, but reliable mode!